Description: Marvel vs Capcom took arcades by storm when it was released in 1998. A game were the most popular Marvel characters vs the most popular Capcom characters was a dream come true. Running on the CPS2 arcade engine this game had amazing tag team fighting gameplay. 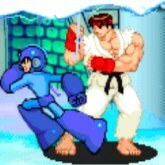 Capcom's roster includes Captain Commando, Chun-Li, Jin Saotome, Mega Man Morrigan Aensland, Ryu, Strider Hiryu and Zangief. While Marvels Roster included Captain America, Gambit, Hulk, Spider-Man, Venom, War Machine and Wolverine. I just love all the characters in this game. My personal favorites are Spider-Man, Ryu, Srider and of course Wolverine! The variable assist, bassically tag team while fighting is what makes MVC so much fun! Hope you enjoy it! Game Controls: Shift Key = Insert Coin. Enter Key = Start. Arrow Keys = Move. "A,D, S, Z, X, C" Keys = Action Buttons. Select the option icons located at bottom of the game screen to edit controls, Play In Full Screen, Save/Load game progress, and change graphics settings.